Let the nature touch you from within. 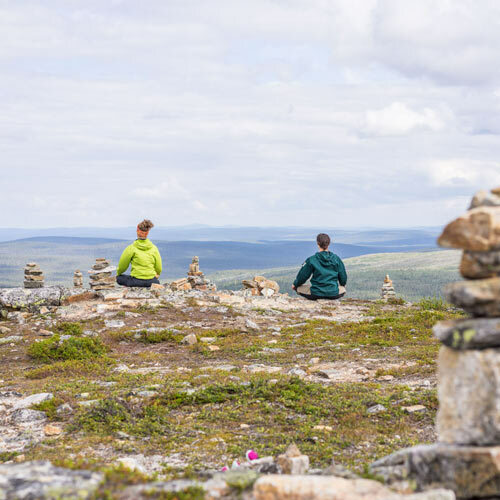 Participate in a unique yoga hike which will take you to the untouched wilderness area on Paistunturi in Utsjoki. In the spacious landscape you will have room to breathe and time for yourself. We will hike around 25 kilometers to the wilderness o Paistunturi and you won’t have to carry anything but your daily gear. The rest of the gear will be taken to the destination for you. At the destination either shared accommodation in a cabin or in the privacy of your own tent. We will perform yoga exercises (e.g. 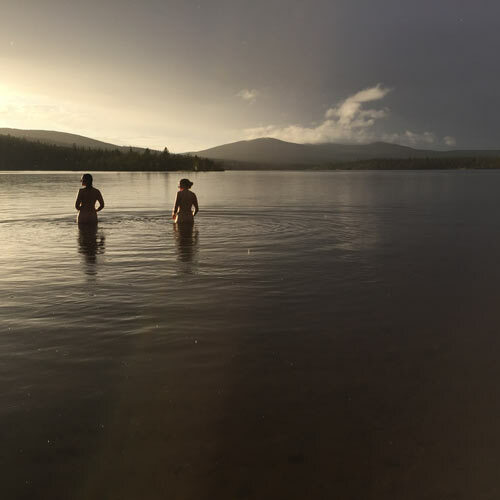 astanga, yin) twice a day, enjoy being in nature, bathe in the sauna and outdoor hot tub or take a dip in a lake. It is also possible to go fishing. Delicious and nutritious fish- and vegeterian food will bw served three times a day. The food will be made using as many local and organic products as possible. A limited number of participants will guarantee individualised guidance in both astanga and yin yoga. We reserve the right to changes in the program. inside the cabin the group divided into two. In astanga there is a possibility to have groups of different levels. In yin same exercise for all. 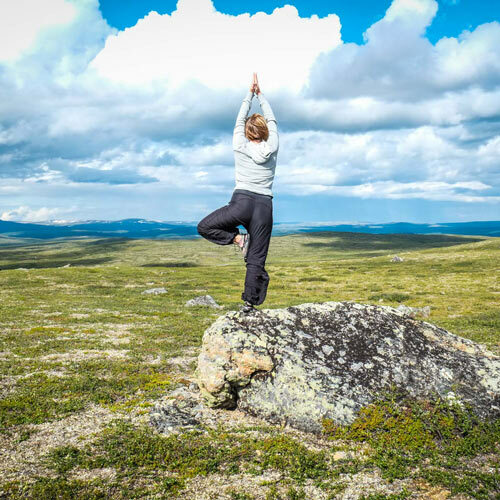 You can participate in the yoga hike even though you would never have done yoga before. After – 780€ in the cabin all inclusive starting from Utsjoki. in the evening. + 40 euros with there transfer from Ivalo. A deposit of 100€ will be paid upon registration (the deposit will only be returned if it is not possible to do the yoga hike due to a small number of participants). The price does not include trips to/from Utsjoki. When you register and pay the deposit fee (100€) you will show that you understand that you are participating in a yoga hike including wellness for the body and mind on your own responsibility. Make sure that you have a valid accident insurance. After registration you will receive two separate invoices by mail: one or the deposit (100€) and another for the remainder of the cost. The remainder of the cost will be paid in its entirety 1.7.2017. By registering you will also accept the booking terms, conditions and cancellation policy. If you cancel your booking, cancellation fees apply. Notification of cancellation must be made in writing. If the cancellation is made 28 days before the event at the latest, the payment but not the deposit (100€) will be returned. If the cancellation is made 14 days before the event 50% of the full price will be reserved. If the cancellation is made later than 14 days before the event the payment cannot be returned. The client can always find another person to take his/her place. If there is a major obstacle (force majeure) or reasons due to a small number of participants the yoga hike can be cancelled. In the case the clients will be notified of the cancellation and have the right to get full payment back. Warmly welcome to the Yoga in Fells week in Kiilopää! During the week You can practise yoga, breath pure air, deeply relax and enjoy of the nature all around you. You can feel and see Lappish fell nature and learn about it. We will explore the fells and untouched forests. Taste the lives of Kiilopää birch and pick berries. We do hiking and barefeet walks. Yoga and meditation will be hold out in the nature if the weather is good enough. We make asanayoga-practicies, which make your body strong and flexible. Gentle yoga-therapy-practices as well as breathing and meditation-practicies. We also make daily trips in to the nature: fells, woods and outside the trails – also a trip on barefood. After the day in the fells relax in smoke sauna and refresh in fell brook. Through yoga practices during the day your body and mind will find a piece and balance. Price incl. guided trips and practises as in the progarm. Hotel accommodation in twin or single room. Full board from arrival day dinner to departure day breakfast. Smoke sauna visits. Target group: This week is to all interested in Yoga and well-being. During the week we move a lot in nature so you should be in good basic shape. Equipment: good shoes for day trips ( hiking shoes), small packsack, thermal bottle, suitable clothing – also warm clothes. Yoga mats ( if you have). Mats can be borrowed or bought on the spot. Nice and comftortable training clothes. Notebook and pen. A trek that takes you straight to the heart of the fell highlands. On this trip you will forget everyday life, your mind will be freed and you can achieve your natural self. A magnificent boat trip along Luirojoki River shortens the day’s trek and gets us straight into the heart of the wilderness. We spend the days hiking in the handsome fell highland landscapes, practicing yoga and meditating in nature. We stay overnight in private wilderness cabins. Camping with tents is also possible. This trek is also the path into your true self. Trekking gives you the opportunity to work on your thoughts and lapse into your own meditative state. The trek requires a good level of fitness, but you don’t need to be a mountain goat to cope fine on this trip! Join us on this fantastic trek! Please note! Lunch in Sodankylä on the outward journey is not included in the price. The trek requires a good level of fitness. Each participant must carry their own supplies and some of the shared supplies, approximately four kilograms of shared supplies. There will also be karma yoga, such as preparing food together. You will get list of equipment. It is a guideline for the equipment you will need and should be modified to your own requirements. In addition, each participant will be expected to carry some of the food. The total size is approximately one shopping bag and weighs 4 – 5 kilograms.